Hosting the perfect dinner party can be a very challenging endeavor. Depending on the situation, most people spend hours toiling away in the kitchen, tirelessly committed to preparing the dishes just right, only to realize that, after all, that work, they still need to decorate and set the table to accommodate all the guests; which can be a whole new challenge in itself. While in most situations, people take the table decorations for granted, it’s the formal occasions that will set you apart from the other hosts. Accessorizing the table can take just as much finesse as presenting a dish, and what better way to top off a great presentation than with a perfectly beautiful napkin ring? This article aims to inform you about the best and most gorgeous napkin rings available for purchase on the net, so that, with the perfect decoration and accessories, you may stand out as the best host in the neighborhood. 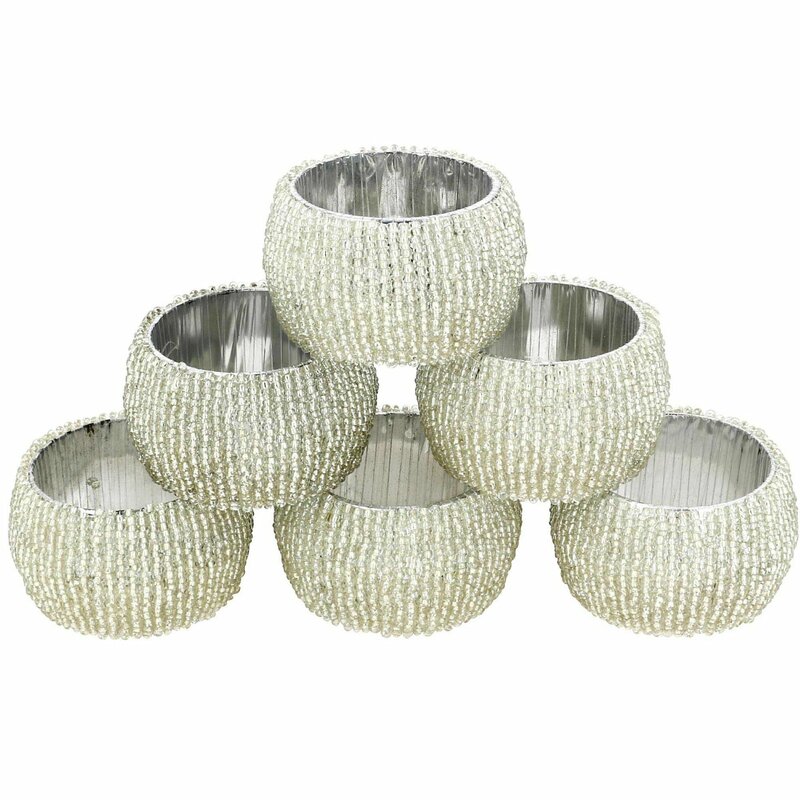 This beautiful set of 25 napkin holders is made out of rhinestone mesh. The holders themselves are 5 inches long and 1.125 inches wide, so most napkins will fit it. Their rhinestones are held together with hot glue to ensure that strong, sturdy build. This particular set of napkin holders includes 6 pieces. Each ring is handcrafted using traditional Indian techniques. The exterior of each piece is lined with rows upon rows of scarlet glass beads. 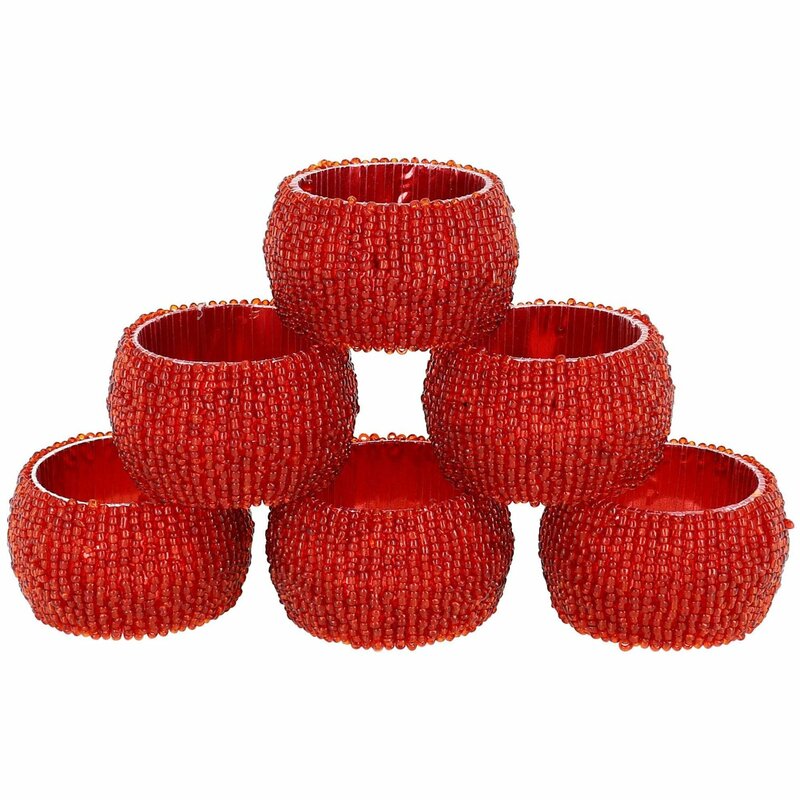 The red tinge is perfect for oriental-themed restaurants or occasions. 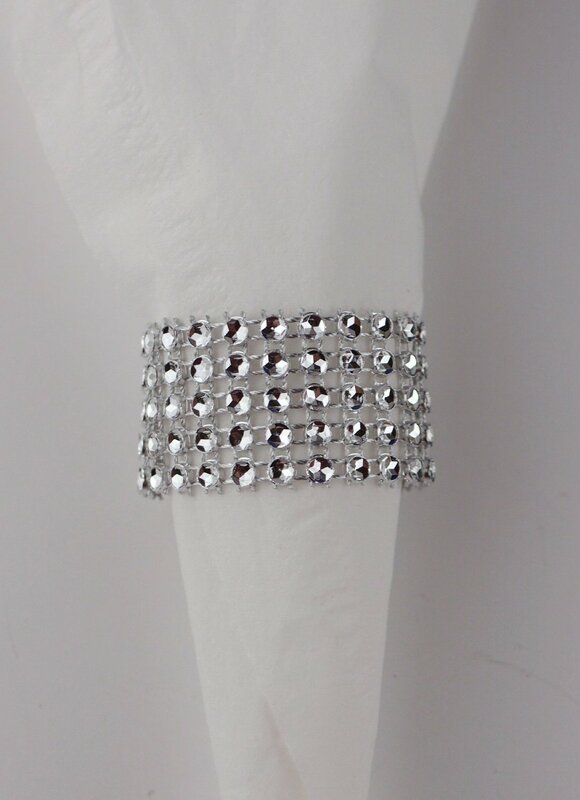 Similar to our previous entry, this beautiful set of 6 napkin rings consists of 1.5-inch diameter hoops, lined with rows of silver glass beads. Similarly, this set is also handmade in India following the highest standards of craftsmanship. If you don’t like the silver tone, you might prefer this golden variant. Simplicity at its finest, this silver napkin ring consists of a stylized hoop, with a big pearl in the center. The design is perfect for those occasions when you want to decorate your table, but without using an excessively striking napkin holder. Sometimes, less is more. “Sturdy, with a festive design” are the words I would use to describe this particular set of holders. 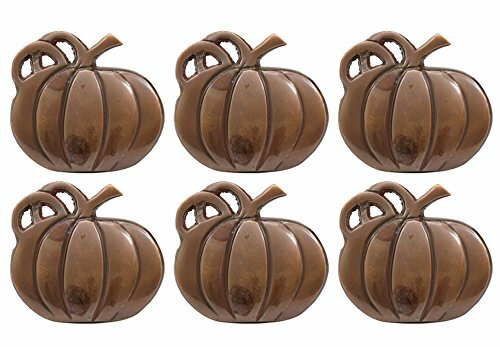 The wooden design in pumpkin shape makes it a great adornment for Thanksgiving, Halloween, or any autumn dinner party. Flowers can make for very nice table decorations, but who said they have to be set in a big vase exclusively? 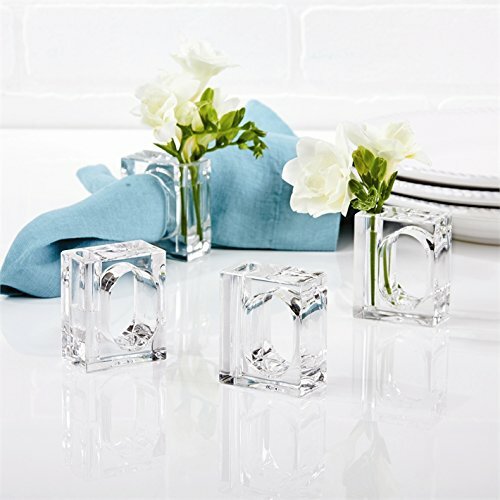 The Two’s Company napkin rings are made out of clear acrylic plastic and feature a slot where you can set your favorite (small) flowers. The quality craftsmanship from India is evident in the Shalinindia Handmade napkin holders. The minimalist design makes it a perfect accessory for any type of occasions. The hardwood material and natural finish will ensure that these rings will stand the test of time. 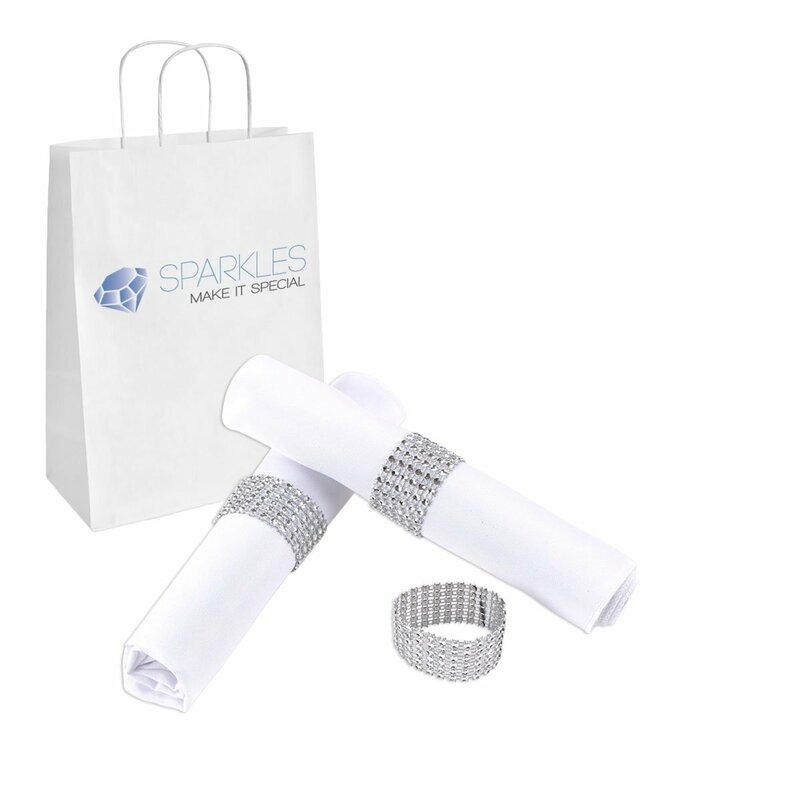 This set of 10 napkin rings is made out of pure “bling”. The mesh design and silver coloring makes it perfect for black-tie dinners and other formal meals, without being too striking to the eye. In case bling and shiny holders are too much for you, this set of burlap napkin rings are lined with just a strip of mesh. The conservative design means that it’s perfect for everyday use. 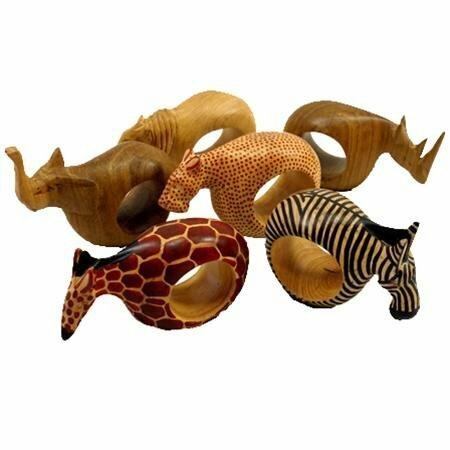 Bring the joy of the safari to your dining table with this mahogany animal napkin rings. The pieces are modeled in the shapes of popular safari animals such as cheetahs, giraffes, rhinos, elephants, and zebras, among others. 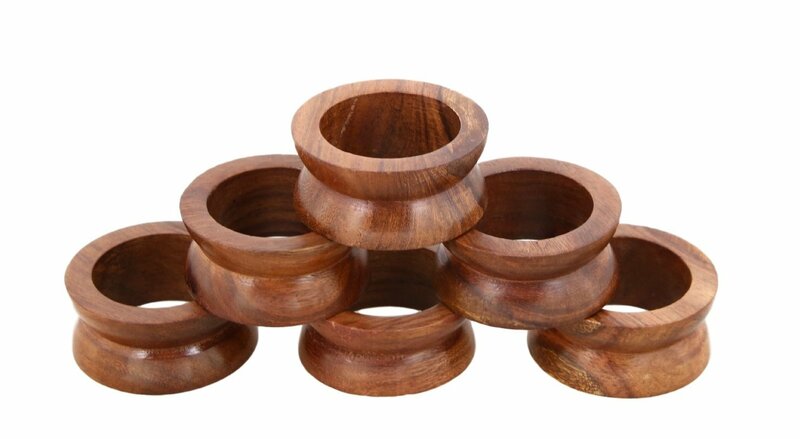 The mahogany material and natural finish ensure that these rings are well preserved throughout the years.